The Single currency breaks higher as the market continues to digest the disappointment in the U.S Consumer Sentiment figure which was released last Friday. Yesterday's U.S Retail Sales met expectations but did not provide enough strength to raise the chances of a four interest rate hikes this year. Today, Fed Powell is set to address the U.S Congress and provide them with his outlook in regards to the U.S economy. Markets will be eyeing today's event as it will not only involve questions related to increasing short-term interest rates but also questions related to the risks associated with the inverted U.S yield curve. On Monday, the Euro bounced off the 1.1620 level with a V-bottom reversal pattern. The pair has recently broke above the 50-period moving average (yellow) and the 200-period moving average (purple) signaling bullish momentum. 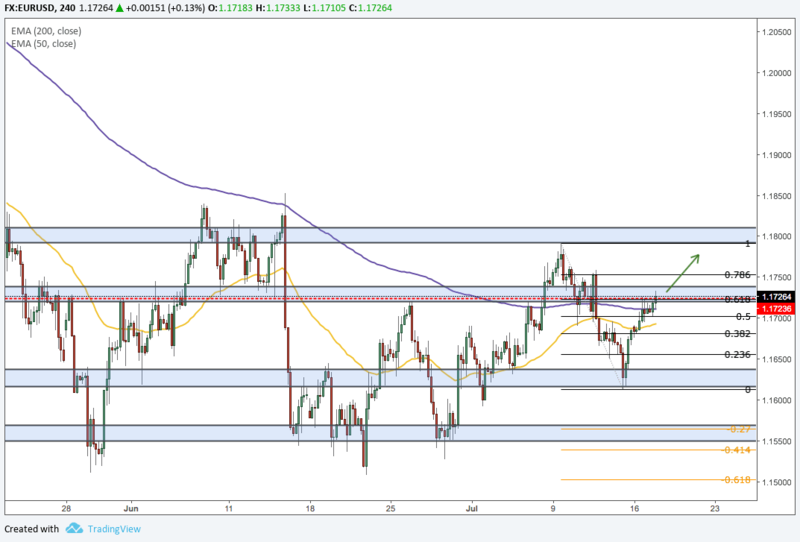 Following the break of the moving averages, the bull run was also strong enough to break above a key price-action resistance level (1.17240) which coincides with the 0.618 Fibonacci retracement. This break exposes the 1.1800 level.